It’s cooling down in many parts of the country and autumn is right around the corner. Add to that, the kids are back in school! It’s time to turn our attention to comfort foods. Warm one dish meals that are filling, healthy, and of course – delicious! You will love our vegetarian pot pie recipe. Why? Two simple words – puff pastry. If you prefer to use your own pastry dough that you make yourself, that works as well. So choose your crust, choose your flavors, and use your imagination! Pot pies are so easy, and you can make them big enough for a large family, or make several individual pot pies and freeze them for a quick meal. For the record, this recipe in the picture was made with a store bought vegan puff pastry dough. Roll out 8” squares, fill with your favorite vegan curry and fold into triangles. Brush with a little olive oil and cumin mixture and bake. Fill puff pastry squares with mixed fruit, fold into turnovers, sprinkle with a little sugar and bake. Terrific with an all-fruit sorbet or non-dairy icecream. Cut puff pastry into strips, roll them in cinnamon and brown sugar and twist. Put the twists on a baking sheet and bake until golden. Roll out 6” squares. Smear your favorite nut butter on the dough. Add a sprinkle of brown sugar, and lay banana slices all over the surface. Now roll it all up and bake it until golden brown. Kids love this! Tip: Allow frozen puff pastry to thaw at room temperature for about an hour. You want to work with COLD dough, but it should be thawed. If your dough becomes too warm, put it back in the fridge to cool. Dust your counter top with a little flour and roll your dough out evenly. Puff pastry sometimes shrinks back as it’s baking, so if you are using it for a pie topping, remember to let it extend past the lip of your baking dish or pie plate just a little. 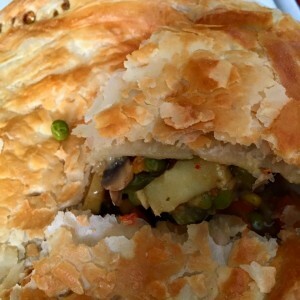 Creamy, delicious and nutritious vegetables with a golden crispy pie crust. 1. Dice all of the vegetables finely. 2. In a large pot, heat the oil and add all of the diced veggies. Stir well and saute until the vegetables start to cook through. 3. Add the vegetable broth (or water) and simmer for 5-10 minutes. 4. In a small bowl, whisk the flour and water together. 5. Add the flour and water mixture to the pot and stir well. 6. Simmer on low for 5 minutes, until potatoes are almost cooked. 7. Grease a pie plate or baking dish. 8. Pour the vegetable mixture into the dish. 9. On a floured surface, roll out the dough you will use as a topping to your pot pie. 10. Put the dough on top of the pie filling and pinch the edges. Using a knife, make several slits in the dough topping to let the pie filling vent as it cooks. 11. Bake for approximately 20-30 minutes at 350, or until the dough is golden and deliciously ready. Make several small pies out of this recipe and freeze for meals ahead of time. You can vary the spices, remove the curry, add beans, add tofu, whatever you like! Just remember to have a delicious rich base to your pie.